Robert "Bob" Ludke Jenney was born March 21, 1914 in White Plains, New York. His father, Albert Jenney, was born 1885 in New Hampshire. His mother, Clara E. Ludke, was born 1893 in New York. His parents married in Westchester County Civil Court in 1912. They lived at the home of his maternal grandparents, George and Katherine Ludke, at 24 East View Avenue in White Plains. His grandparents were elderly German immigrants. His father was a traveling salesman. His mother was a book keeper at a hardware store. In 1926 when he was twelve years old his parents divorced. In 1929 his mother married her second husband, Theodore L. Townsend, who was born 1879 in NY and worked as a plumber. His mother moved to live at his stepfather's apartment building at 41 South Stone Avenue in Elmsford, NY, while he continued to live with his retired grandparents in White Plains. 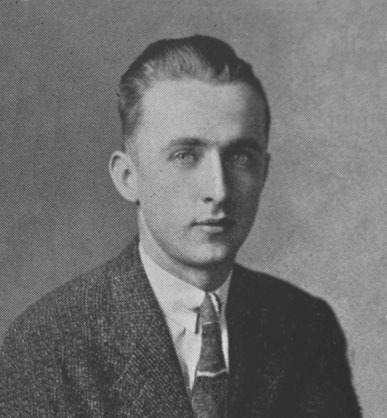 In June of 1933 he graduated from White Plains High School, where one of his classmates was Jim Chambers. They were both inspired to become successful artists and their art teacher encouraged them to go to NYC for more advanced art training. In September 1933 both boys enrolled as full-time three-year art students at Pratt Institute School of Art in Brooklyn. Their teachers included H. Winfield Scott, John Fleming Gould, and Frederick Blakeslee. In June of 1936 they both graduated from Pratt. His yearbook quotation is, "All is art save time for leisure, time for love and time for pleasure. 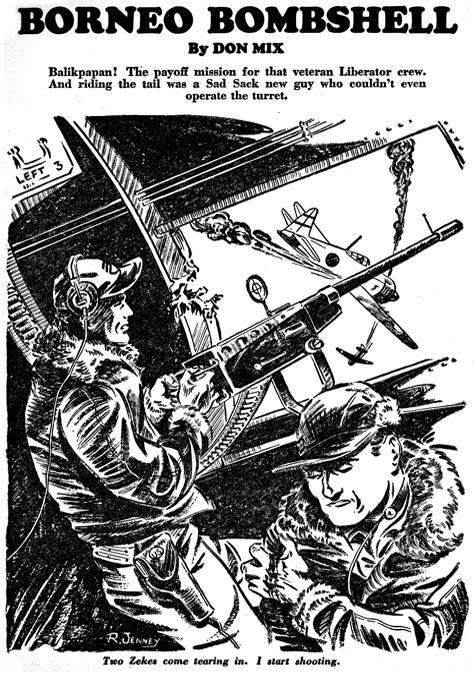 The picture's no good without a fight, though a machine gun will make it perfectly all right." 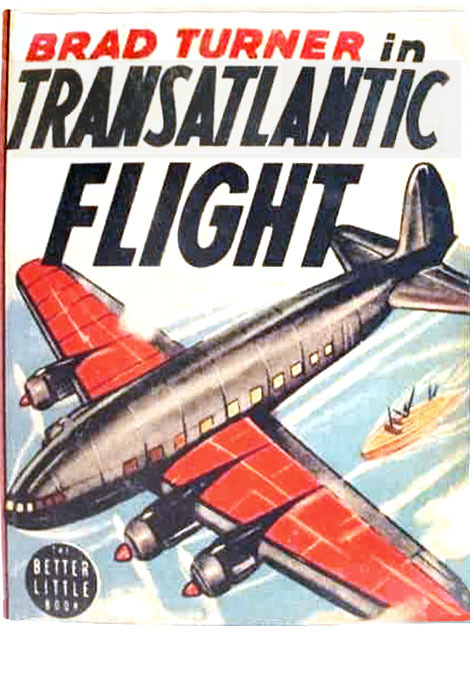 In 1938 he illustrated several juvenile books, such as Brad Turner in the Transatlantic Flight, Air Fighters of America, Pilot Pete and his Dive Bomber. 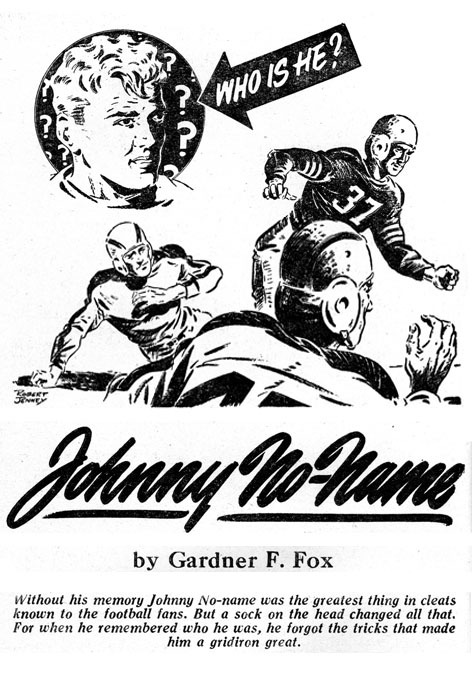 In 1939 he drew Gary Hawkes for DC Comics. 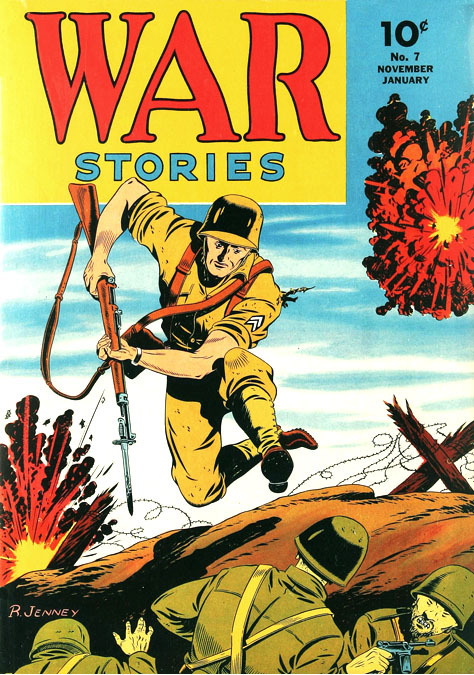 He eventually worked for most comic book publishers, including Centaur, DC, Dell, Fawcett, Gilberton, Hillman, Marvel, Quality, and Street & Smith. 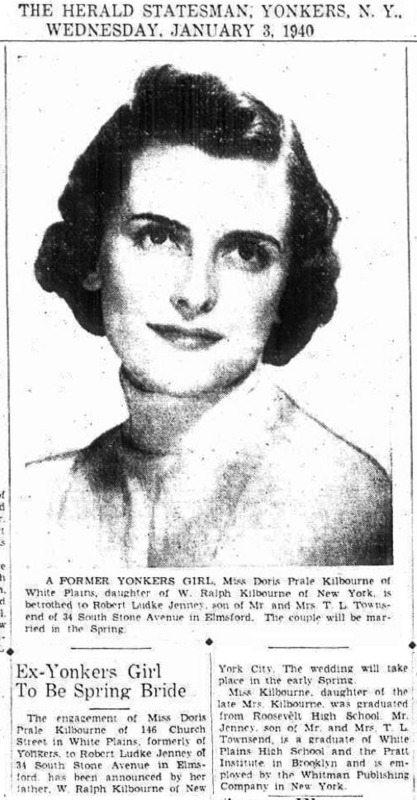 On April 14, 1940 he married Doris Prale Kilbourne, who was born 1912 in Yonkers, NY. She lived at 146 Church Street in White Plains and worked as a saleswoman at a perfumery in NYC. She was a graduate of Roosevelt High School. The best man at their wedding was Alden McWilliams. The newlyweds moved to an apartment at 41 South Stone Avenue in Elmsford, NY, which was next-door to his mother and stepfather. His stepfather became the Plumbing Inspector for Elmsford Town Zoning Commission. 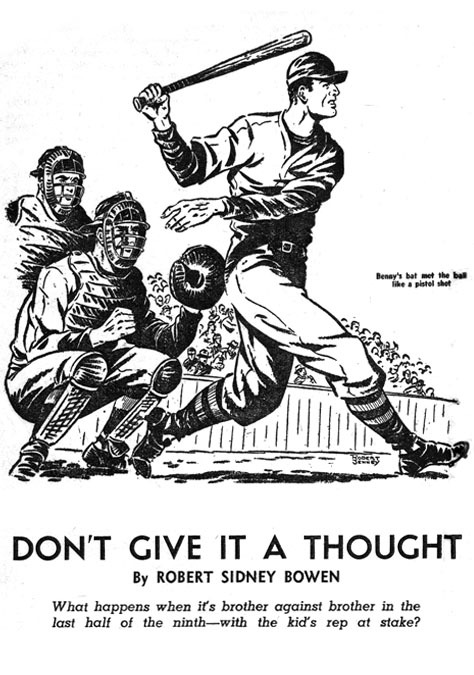 On October 29, 1942 Robert Jenney was drafted in the Navy. He served as Seaman Second Class and was stationed at Sampson Naval Training School in Upstate New York. He learned to draw terrain maps for the U.S. Navy under guidance of his instructor Allen Anderson. 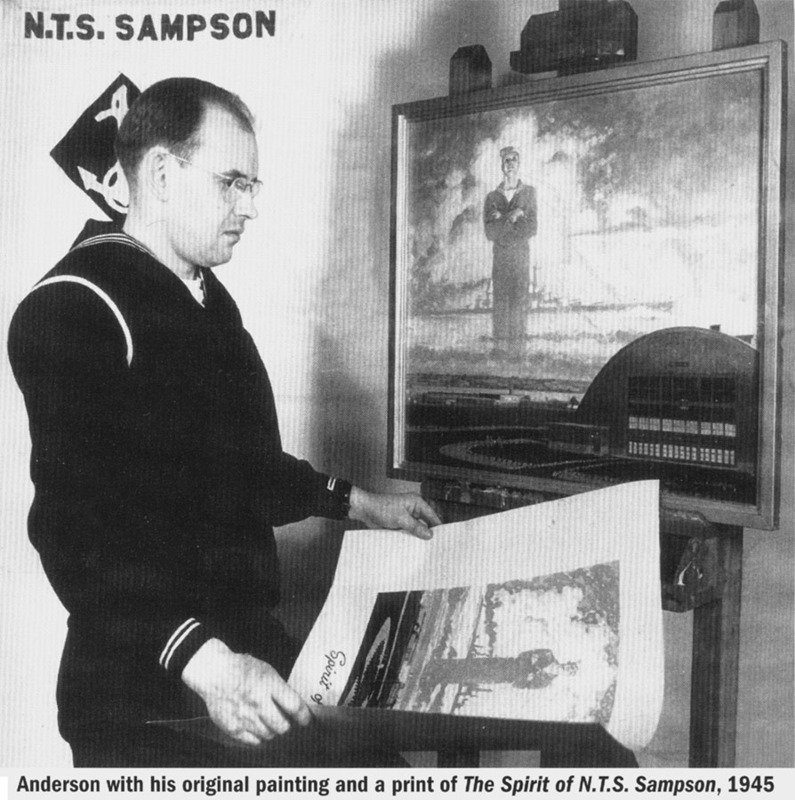 In his spare time, Anderson painted the personification of Camp Sampson, which delighted the base commanders, who reproduced it as a WWII propaganda poster. 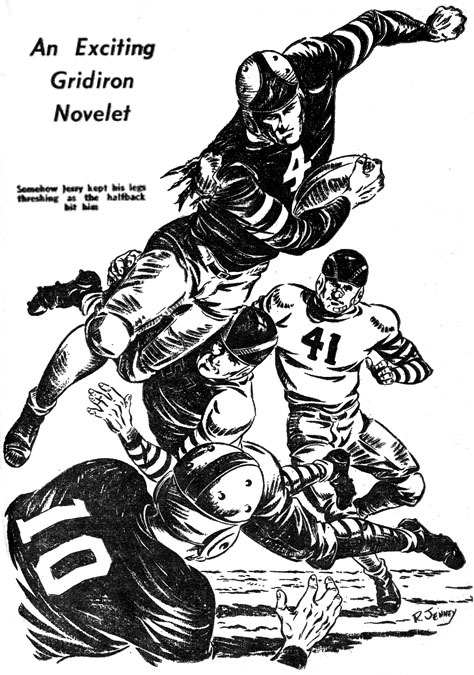 After the war both artists resumed their art careers in the NYC publishing industry. Allen Anderson introduced him to A. 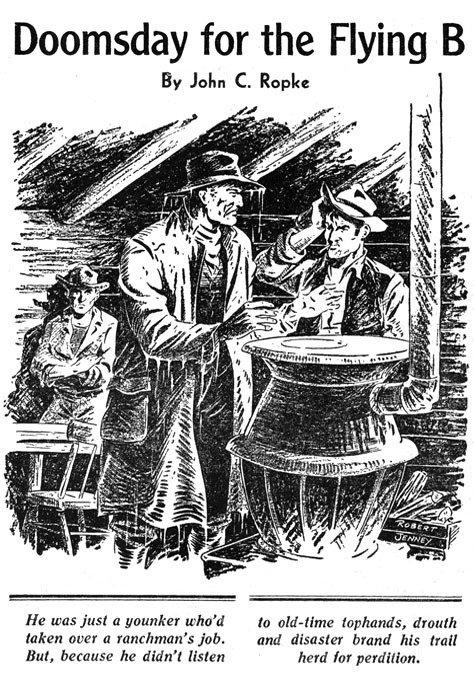 A. Wyn at Ace Magazines, where he began to draw pen and ink story illustrations for many pulp magazines that had covers painted by Allen Anderson, such as Ace Sports, Ten Detective Aces, 10-Story Detective, Western Aces, and Western Trails. 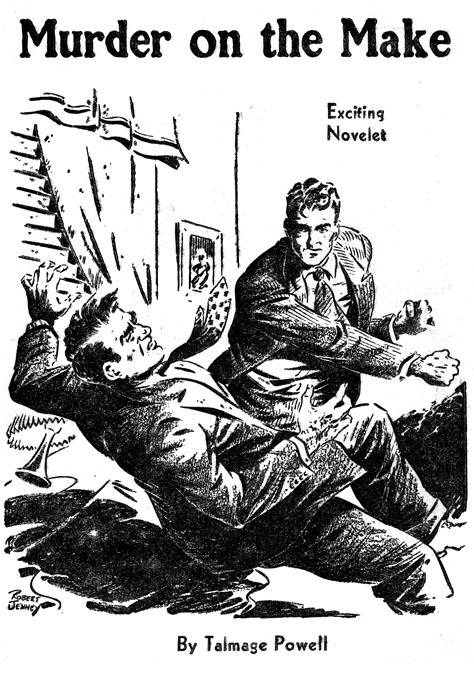 His work also appeared in pulp magazines produced by Fiction House, Thrilling and Standard Publications, such as Famous Western, Exciting Sports, Popular Football, North-west Romances, Popular Sports, Super Sports, Thrilling Football, Thrilling Sports, and Wings. In 1946 he drew a syndicated newspaper comic strip Wendy the Waitress. In 1947 he and his wife moved to Springdale, Connecticut, where their son, Gregory Albert Jenney was born in 1948. 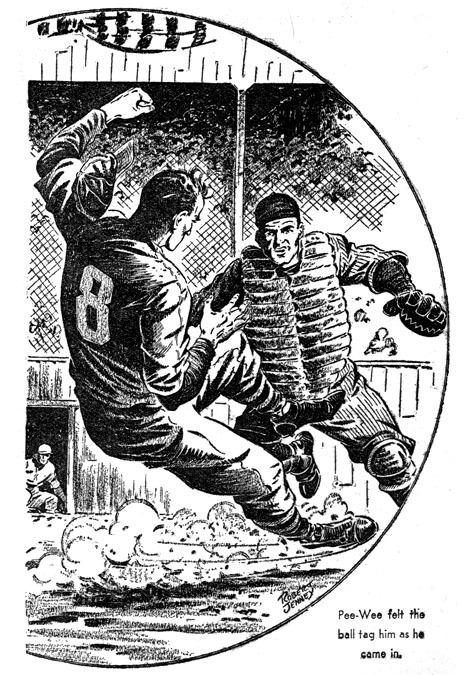 During the second half of the 1950s he contributed many illustrations to a juvenile reference work, The Picture World Encyclopedia, published by Charlton. According to advertising, this was the "first truly modern picture book encyclopedia specially written for children 6 to 16 and offered at fifty cents for each of the 12 volumes. There's never been an encyclopedia so easy to understand, so thrillingly presented, so up-to-the-minute with the very latest facts! No long wordy explanations. No dull, confusing language. The Picture World Encyclopedia informs in a bright, lively way. Every subject is illustrated in full color, with over 6,000 pictures in all!" This ambitious project took five years to complete and included illustrations by many artists, such as Rafael Astarita, Gene Fawcette, Paul Jepsen, Bob Powell, and H. C. Kiefer. In 1962 he and his wife moved to Stamford, Connecticut. 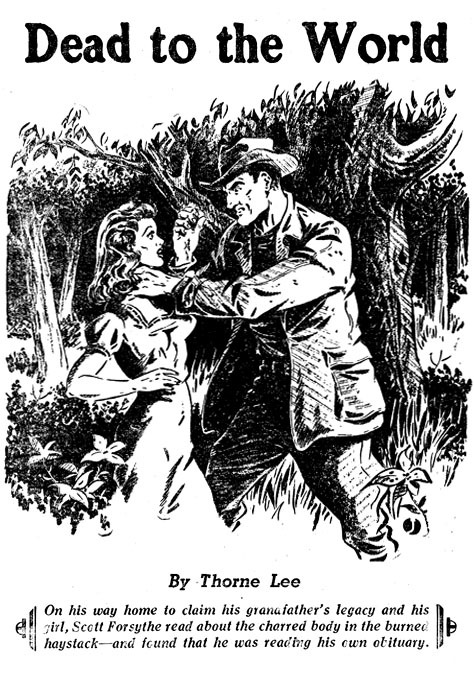 Besides illustrating pulp magazines and comic books Robert Jenney also had a significant career as a pen and ink story illustrator for juvenile fiction books that were based on popular TV shows from the 1950s and 1960s, such as The Mickey Mouse Club, Circus Boy, Cisco Kid, Gunsmoke, Wells Fargo, The Big Valley, Dr. Kildare, Lassie, Gilligan's Island, and Rat Patrol. 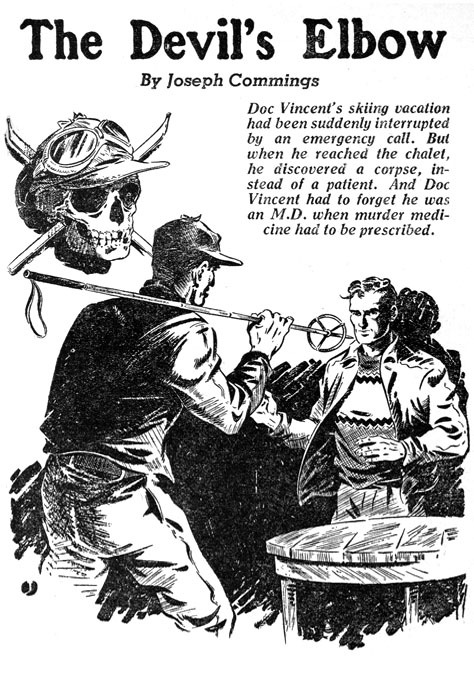 In the 1968 he drew for Warren Publications Eerie Comics and Creepy Comics. In 1969 he and his wife organized an art show of sixty-six paintings by fourteen Connecticut artists at the Annual Fine Arts Festival in Rye, NY. During the 1970s he worked at an art agency to produce advertising, promotional brochures and annual reports. In 1982 he drew the syndicated newspaper comic strip Bringing Up Father. In 1993 they moved to Medford, Oregon, to be near their son. They lived at 1933 Redbud Avenue. His wife Doris Kilbourne Jenney died in Medford, Oregon at the age of eighty-four on October 28, 1996. 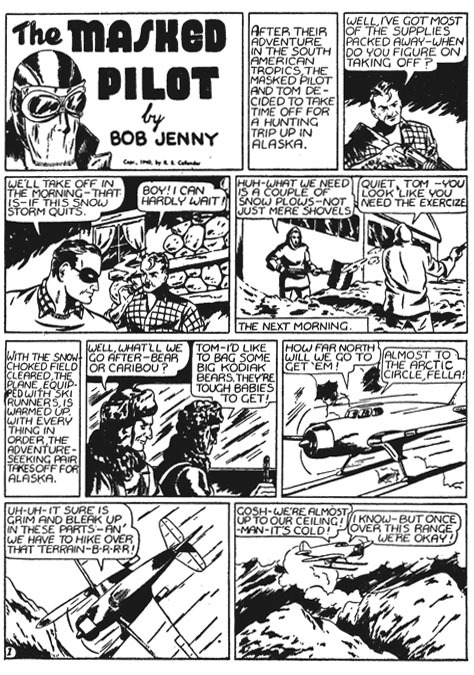 Robert L. Jenney died at home in Medford, Oregon, at the age of eighty-six on December 19, 2000.